Rice Krispie Treats | Dessert Darling that I can hardly stand it. I struggled to find the one dessert that I would feature in this post and eventually landed on these Rice Krispie Peep Pops by Love From the Oven. 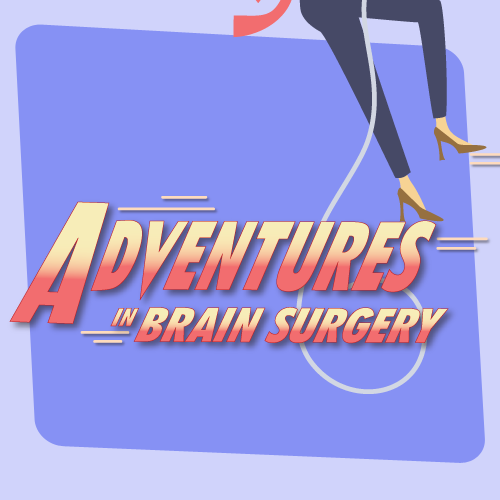 For one thing, I Love everything by Love From the Oven: it is such a creative and darling site! 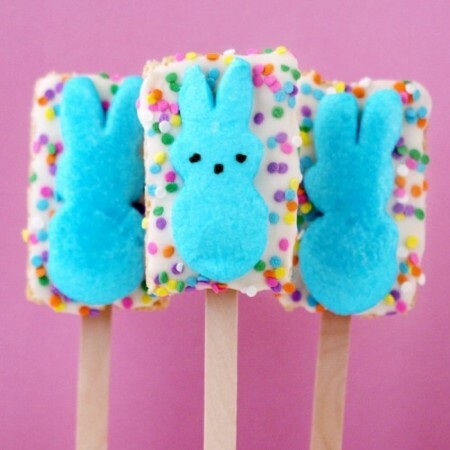 Furthermore, these Rice Krispie Peep Pops look festive, Eastery, and the thought of sinking my teeth into them kinda makes me die a little. Surely they taste like Heaven. Really sweet, and sugary Heaven. Ha! I bet they’d also be great with dark chocolate (though not as pretty). Woa, watch out cupcakes! I think there’s an untapped market to bring back the nostalgic crispy treat in gourmet form! 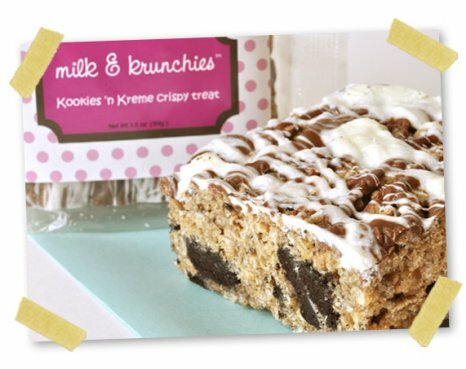 Clearly, Milk and Krunchies is not the company to do so, but someone out there would enjoy an enthusiastic audience if they were to make fresh, delicious renditions of the Rice Krispies treat. I spotted a promising display of “Marshmallow Dream Bars” at Starbucks today and had to buy one in vein of the Facebook response. You could tell this shiny bar would be nice and chewy as it sported whole little marshmallows in the batch. Additionally, the sign advertised that the Dream Bars were made free of high-fructose corn syrup. Considering that’s not an ingredient in the traditional recipe, nor is it even an edible additive, I considered this a good thing. When I brought the treat up for my first bite though, I smelled a faint strawberry flavoring. Hmmm, that was odd. I took a bite and pondered….it didn’t taste like sweet fruit, in fact, it tasted almost like a normal treat.. however, something was off. A few more bites and I determined that they must have used cheap butter. Well, what can I say, this was much better than the Milk and Krunchie rendition that I just had a few days ago. Not perfect or divine, but really not all that bad. 3 cherries for Starbucks’ high-fructose corn syrup free Marshmallow Dream Bars! After a string of fantastic desserts this week, I had a disappointing experience with a fancy Rice Krispie bar that looked far more delightful than it’s execution. The first bite of my Kookies n’ Kreme selection completely let me down. Instead of a fresh and chewy trip down memory lane, I encountered a firm and artificial bar. I then checked the ingredients to see some horrific items listed, a few of which I can’t even pronounce. Bummer! I was totally duped by the adorable packaging. (Sigh).. sorry Milk and Krunchies, but you missed the mark on this one.